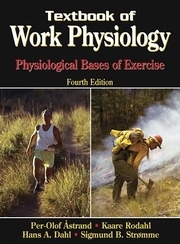 This updated and revised fourth edition of the respected Textbook of Work Physiology combines classical issues in exercise and work physiology with the latest scientific findings. The result is an outstanding professional reference that will be indispensable to advanced students, physiologists, clinicians, physical educators—any professional pursuing study of the body as a working machine. Written by world-renowned exercise physiologists and sports medicine specialists, the new edition retains the important historical background and exercise physiology research conducted by the authors over the past 40 years. In addition, it brings you up-to-date on the growth in the field since the previous edition, presenting today’s most current scientific research findings. Beyond the scientific details, the book also addresses the application of this information to the fields of exercise physiology and work physiology, making the resource more useful than ever. Advanced textbook for exercise scientists, sports medicine specialists, clinicians, and graduate-level students in exercise physiology. Per-Olof Ã¯Â¿Å“strand, MD, PhD, is a pioneer in the field of work physiology, with his research focusing on the oxygen transport system in humans. Now retired, he made numerous advances in the field, winning many awards and fellowships including the Officer de l'Ordre des Palmes AcadÃ¯Â¿Å“miques from France in 1975. Dr. Ã¯Â¿Å“strand has authored approximately 200 publications and has been invited to speak in 55 countries outside Sweden, where he resides today. Kaare Rodahl, MD, professor emeritus, is the author of numerous scientific publications in the fields of the physiology of exercise and work physiology, nutrition, metabolism, environmental physiology, and stress. He was coauthor with Per-Olof Ã¯Â¿Å“strand in all three previous editions of Textbook of Work Physiology, including the last edition in 1986. In 2001, he was listed in 2000 Outstanding Scientists of the 20th Century. Hans A. Dahl, MD, is professor of anatomy at the Norwegian University of Sport and Physical Education, works at the University of Oslo, Norway, and has been active in the field of muscle biology for most of his professional life. He is author and coauthor of several anatomy and physiology textbooks. Sigmund B. StrÃ¯Â¿Å“mme, PhD, is professor of physiology at the Norwegian University of Sport and Physical Education. He earned his PhD from Yale University in 1967. Since 1968 he has researched and taught at the graduate level with emphasis on exercise and work physiology. He is the author and coauthor of several scientific publications and books on effects of exercise, sport nutrition, and physical activity and health. He was presented the Norwegian Medical Association's award for preventive medicine in 2001.